In accordance with your right to choose your own health care, Louisiana provides advance medical directives that enable you to designate an agent to oversee your healthcare decisions. 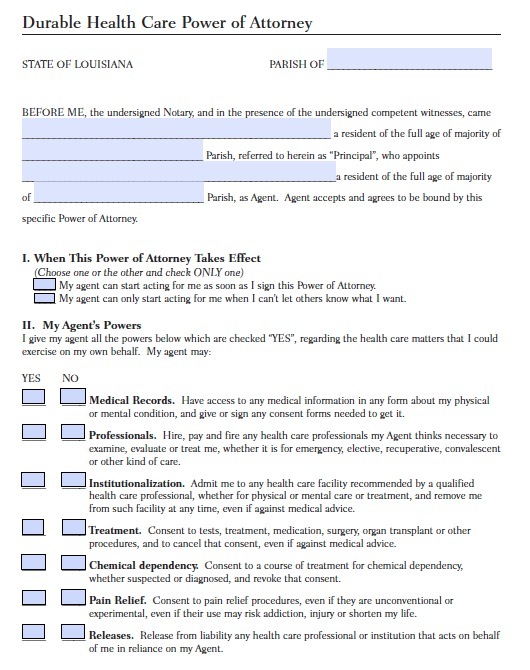 The health care power of attorney lets you specify an agent and then indicate which powers you will grant to him or her. These include the authority to hire and pay medical professionals, to access medical records, to consent to medical treatments and tests or to refuse them, to approve treatments to reduce pain, and to release healthcare personnel from liability. The living will enables you to die naturally if you suffer from an irreversible condition that will result in death in a short period of time, and life-sustaining procedures would merely forestall death. The document allows you to refuse resuscitation, surgery, dialysis, artificial breathing and nutrition, blood products, and antibiotics used to sustain life despite a terminal condition. In Louisiana, you do not need to have these forms notarized, but two witnesses, who cannot be your relatives or spouse, must sign them. It is also advisable to mail a copy of your directives to the Louisiana Secretary of State so that authorities can easily find them.